"AAPT continues to follow the ongoing recovery efforts from the recent hurricanes and fires. As always, our thoughts are with those impacted by these and other devastating events. We also extend our offer to provide any support possible and encourage you to contact us directly if we can be of assistance." AAPT will be accepting post-deadline abstracts from September 30 to November 13. 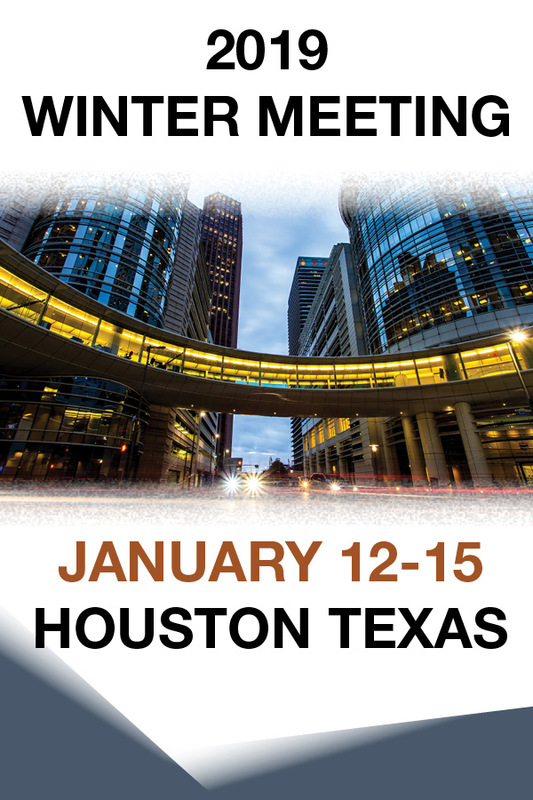 All post-deadline abstracts will be scheduled on January 15 in the last session of the day. This is a great opportunity to present your innovative research and share creative teaching methods with your peers. Please click here to submit your abstract. Click here to view a list of session topics and workshops. AAPT has an opening for a full-time K-12 Program Manager. The ideal candidate should have at least four years' experience teaching physics in U.S. high schools. For further details click here. AAPT and ALPhA (Advanced Laboratory Physics Association) have announced the AAPT/ALPhA Award for undergraduate physics students who have built (and possibly designed), and left as a legacy for future students an advanced laboratory experiment. Do you have a student (or team of students) who might be interested in taking up the challenge to build an experiment new to their own department and possibly receive national recognition, attend a national AAPT meeting, present an invited talk, and receive a check for $4,000? The nomination process is now open. Applications need to be completed by September 30. Read more or Apply. Funding for this award, for the first five years, is provided by TeachSpin, Inc.
AAPT and the American Institute of Physics (AIP) sponsor a competition for high school students to represent the United States at the 2019 International Physics Olympiad. The mission of the U.S. Physics Team Program is to promote and demonstrate academic excellence through preparation for and participation in the International Physics Olympiad. The selection process begins with the F=ma exam. Online registration will open October 2, 2018. One of the fun opportunities during the AAPT Summer Meeting is reviewing and voting on the top 100 photos as selected by the Committee on Physics in High Schools under the direction of Tommi Holsenbeck. The votes have been tallied and the winning entries are posted. View here Congratulations to the winning students and their teachers. Please help us better understand the status of scientists around the world. In September a representative sample of AAPT members will be invited via email to complete the Global Survey of Scientists. The goal of this global, multicultural, and multidisciplinary survey is to study social dynamics in astronomy, biology, chemistry, computing, mathematics, physics, and the history and philosophy of science and technology. The analysis will compare scientists’ and practitioners’ experiences, challenges, and interests across regions, countries, disciplines, sector of employment, and career stage. The insights gained will help the International Science Council and its member unions recommend interventions to increase participation of all people in STEM fields. Once the survey results are analyzed, the responses from AAPT members will be shared with AAPT leadership and membership. You will receive a message from me asking you to complete the survey. Please take a moment to do so. AAPT recently participated in the STEM Inclusion Study, the first large-scale, national study to investigate the experiences of professionals from across STEM disciplines and industries to identify challenges that underrepresented individuals face in the profession. More information about the study and its goals is available on the study’s website https://www.steminclusion.com For a summary of the AAPT Climate Report, click here. Justine Boecker Harren is just beginning her second year of teaching. After graduating from Bethel University with degrees in Elementary Education and Physics Secondary Education. She took a position in an urban school in Minneapolis teaching 9th grade in a physics first classroom. Boecker Harren reflects, “I didn’t know what I was getting into when I took that job.” In the upcoming webinar, Boecker Harren reveals what she knew going in and what she wished she knew going in, and things that worked that first year and many things that didn’t. Join other teachers seeking to integrate engineering into their science classroom with this unique professional development opportunity. Headed by AAPT/AIP Master Teacher Policy fellows Matthew Peterie and Andrew Edmondson, you will learn from experienced and skillful teachers. The cost will be $385 for individual attendee which includes your registration for the year long program and meals for the two days at Olathe Northwest. If a group of teachers from a building or district would like to attend, reduced pricing is available. After registering your team by completing the form below, subsequent correspondence will make arrangements for payment. AIP is seeking applicants for the 2019-2020 AIP State Department Fellowship program. Fellows work at the department's headquarters in Washington, D.C., for a one-year term on topics at the intersection of science, policy, and international affairs. The deadline for applications is Oct. 15. We ask that you share this opportunity with your membership. • Attached is a flyer with more information, which you can post on your website, newsletter or emails to the membership. • Direct link to the application webpage. • Posting in AIP FYI. If you are subscribed to FYI, please forward the email to others. The International Conference on Physics Education (ICPE) will be held October 1-5, 2018 in Johannesburg, South Africa. The theme of the conference is: “Physics Education for Development: a focus on context”. The main objective is to create a platform to facilitate the interaction of various stakeholders that includes physics educators, postgraduate students, teachers, researchers and policy makers working in physics education research and in physics education, from schools, colleges, universities and governments from all parts of the world. The program will include a wide spectrum of presentations including keynote speakers, single and symposium oral presentations, posters and workshops. The conference will be held at the Misty Hills Hotel and Conference Centre, close to the Cradle of Humankind, a World Heritage Site and the famous Pilanesberg National Park. Click here for more information. AMTA acknowledges that summer Modeling Workshops may not work for all people who are interested in taking a workshop. For the spring of 2019, we have scheduled 3 distance learning courses, based on the feedback of almost 500 members who recently completed a survey. The workshops start in January and costs are $825 for non-members (includes a one-year membership) or $750 for current members. Optional graduate credits from Dominican University is available ($100 each, up to 3 credits per workshop). Courses require a minimum number of registrants by December 21th in order to run. Enrollment is limited.